Cycling is a healthy, low cost, low impact way of travelling but currently for many people in Gosforth it is not a viable choice. Although cycling is a relatively safe activity in itself and suitable for many everyday journeys, Gosforth’s roads often feel very dangerous because they are so busy with traffic, especially at rush hour and when children are travelling to or from school. In our post National Walking Month – May 2017 we asked you to help us document locations in Gosforth where there were issues with walking and to share ideas for how Gosforth could be improved for walking. In this post we want to do the same for cycling. Desirable Neighbourhoods. Designing streets to be cycle friendly makes them better for everyone: less traffic, less noise, less air pollution, safer for children to play, and can increase property prices. Air Quality. The chair of the government’s independent advisors on air quality COMEAP have recently confirmed that in order to meet air quality targets we will need not just cleaner vehicles but also fewer vehicles and “as much active transport in the form of walking and cycling as is feasibly possible.” Plus, children cycling are less exposed to pollution than if they were in a car. Road Safety. Introducing cycle lanes separated from traffic have been found to reduce injuries from road collisions for all road users including for people walking and driving. Public Health. Safer cycle lanes encourage more people to cycle, which leads to all sorts of health benefits and reduces the burden on the NHS, which all tax-payers contribute to. Economy. Cycling means people can make the same journeys for less cost, which when added across all journeys contributes to a significant economic benefit including locally where good quality cycling facilities can boost the local economy. Feeling Good. Cycling to work can help you be less stressed and more productive. Children who walk or cycle to school tend to be more attentive and achieve better results and that also means less school run traffic to hold up other drivers. Road Capacity. One of the main purposes of main roads is to help people to get from A to B. Because bikes are much smaller than cars, far more people can travel on the same road if cycling than if everyone was to drive. That’s not to say everyone has to cycle. Many of these benefits can be achieved even with a small shift from driving to cycling, which initially could just be from the 24% of people who cycle once a month or more in Newcastle leaving their car at home a bit more often. Allowing those who can cycle to do so takes traffic off the road that would otherwise be holding up those who do need to drive. The key features of a good cycling network are well understood and are very similar to what is needed for a walking network. It links where people live with where they want to go to. It is sufficiently dense that you are never too far from a safe cycle route. Routes and junctions are safe and feel safe. This includes making sure there is sufficient lighting and avoiding isolated locations as well as ensuring protection from fast moving vehicles. Everyone can use it: older or younger people, families and groups, confident cyclists and those that are less confident, people with disabilities, and all travelling at a range of different speeds. It needs to be safe for key journeys e.g. to/from school and not just on a Sunday morning when roads are quiet anyway. It doesn’t put people cycling into conflict with other road users. Routes are direct to avoid adding unnecessary time and effort to journeys. It is coherent so different routes connect and there is no need to get off and push. It is intuitive, comfortable and attractive to use even if you do not cycle regularly. A good quality cycling network would help prevent injuries. 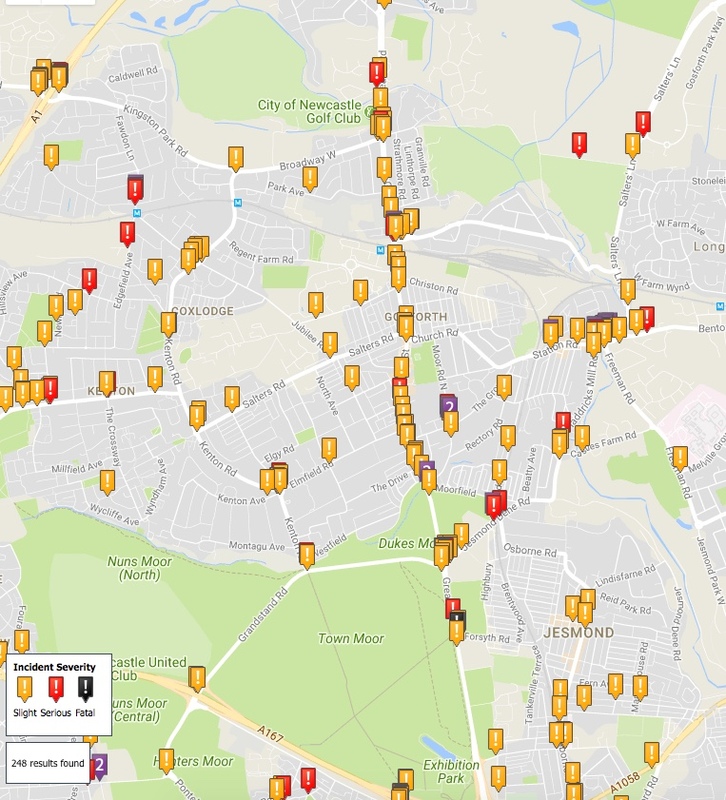 The map below from crashmap.co.uk shows where people cycling have been injured in Gosforth due to road traffic collisions from 2007 to 2016. For any form of transport to be viable, there has to be a connected network of routes that link where people live and destinations such as schools, shops and workplaces. That is true whatever the mode of transport whether cycling, driving, walking or using public transport. The density of a transport network – how close routes are to each other – depends on its purpose. The motorway network and national rail have just one north-south route each passing through NE England, whereas the network of pavements and paths used for walking in cities cover almost every street. 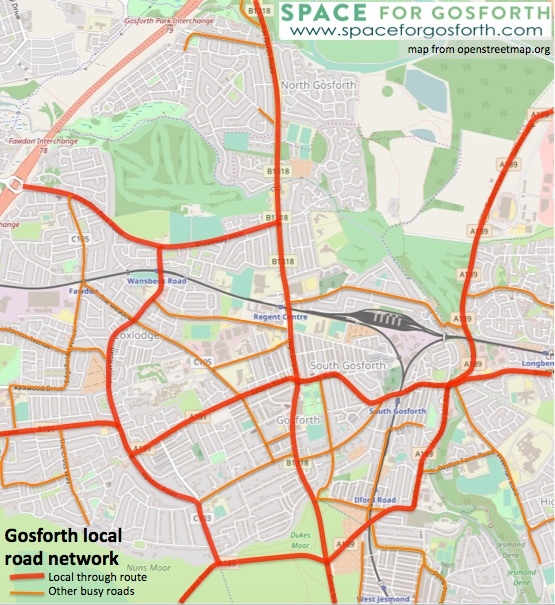 The map below shows a view of the main local road network for vehicle traffic in Gosforth and surrounding areas. Local through roads are shown in red, which shows a density of about one road every one kilometre. Streets not marked red are typically residential areas where the function of the street is much more about the place rather than enabling through traffic. Currently many of these streets, shown in orange, are also very busy with traffic. 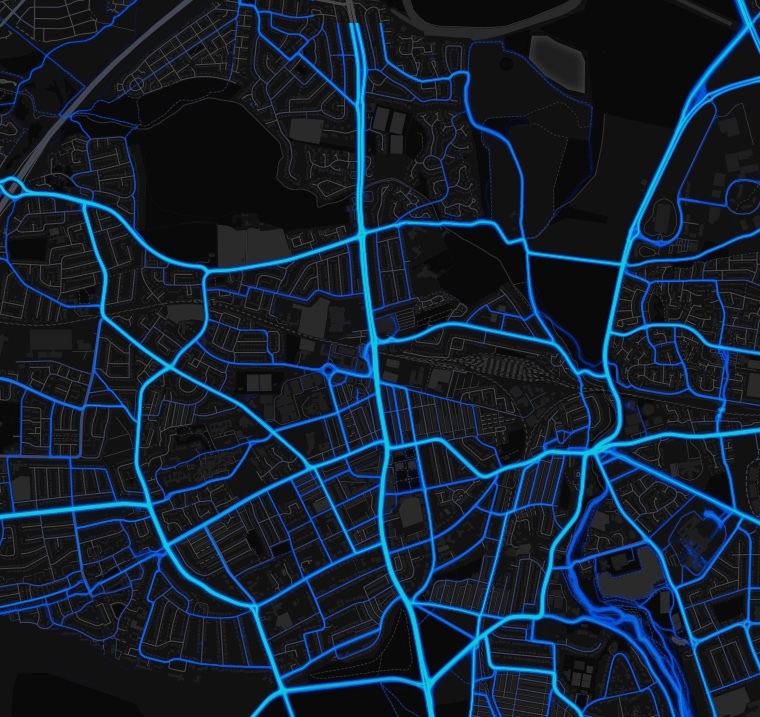 Cycle network guidance based on cities with existing high levels of cycling suggests a mesh of one route every 250m, although the Department of Transport have recommended a less ambitious target of one every 400m. As Newcastle, in common with most UK cities, currently has very little by way of a cycle network, a more realistic initial target would be for there to be one route every one kilometre, in this case similar to the local road network. These cycle routes don’t have to follow the local road network if good alternatives are available, though they do need to meet the criteria above especially connecting homes and destinations and being direct to avoid adding unnecessary time and effort to journeys. In our blog Lots of children want to cycle to school, but hardly any do. 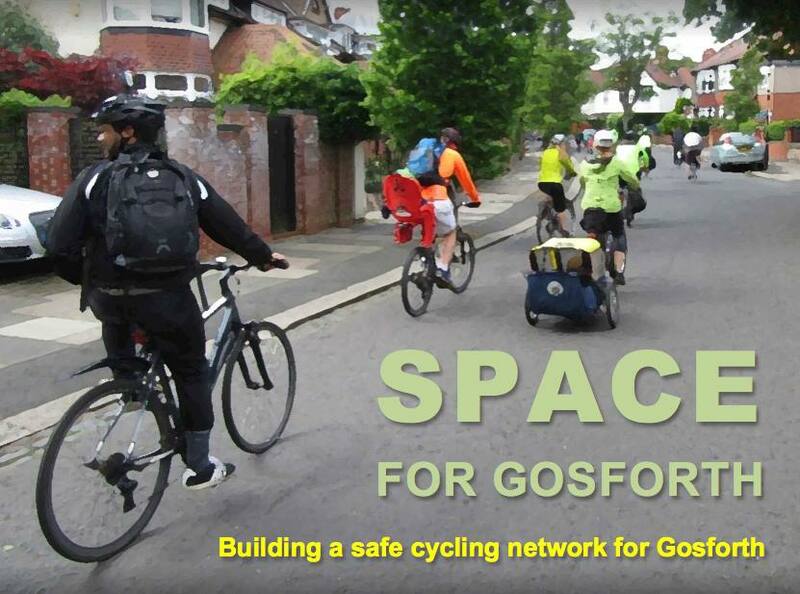 How do we make space for child cycling in Gosforth? we summarised what parents think would make an acceptable safe cycling route for a 12 year old cycling by themselves. Typically for main local through routes this would require physical separation from traffic. Roads with no through motor traffic were also acceptable. 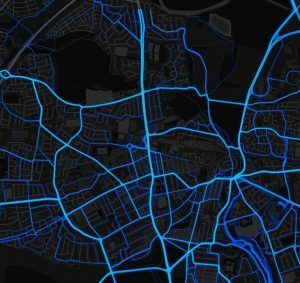 This map from the Strava website shows current cycling routes used by people registered on the Strava website, with thicker lines representing higher numbers of people cycling. Almost certainly actual numbers will be higher than this as many more people will not be registered on Strava. Potentially they could be higher still if not limited by the existing road conditions, in particular where people do not feel safe cycling on Gosforth’s busy roads. Building safe cycling networks has been shown across multiple studies to increase the number of people using those routes. Overlaying local destinations on the map it is clear that many are located on or near main roads, in particular on the Great North Road and Gosforth High Street. 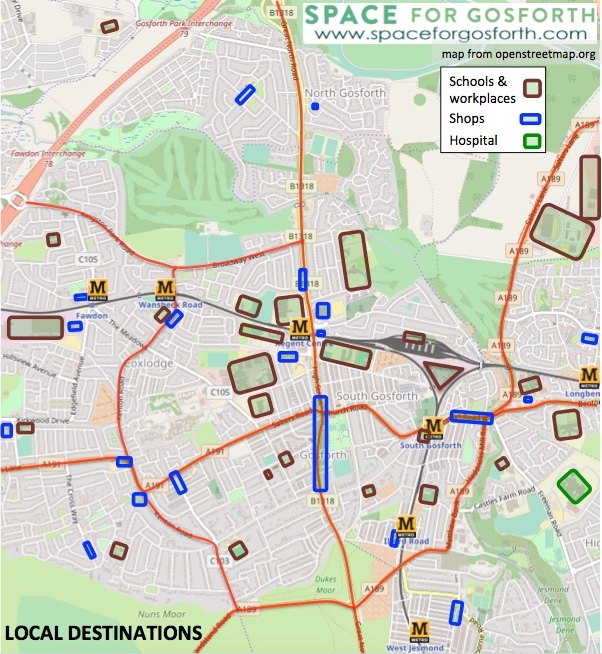 We listed some of the destinations for children and families on Gosforth High Street in the SPACE for Gosforth post 20 mph – the right speed for Gosforth’s children. These are the places that people want and need to go to regardless of how they travel. Travelling on the quieter residential streets we see many people who are cycling to work, or to the shops or to meet friends. It is also possible to avoid much of the traffic (and danger) if you know when and where to cycle, and are prepared to take longer, less direct journeys to get to your destination. only 38% of people rate cycling safety in Newcastle as good or very good. only 25% of people believe that safety for children riding a bike is good or very good. 8 in 10 residents want better safety for people riding bikes. 27% of residents do not ride a bike but would like to. If Gosforth is evaluated against the features of a good cycling network (as set out above) and the road characteristics that parents would consider to be safe for riding with their children, the conclusion can only be that currently local provision is poor. 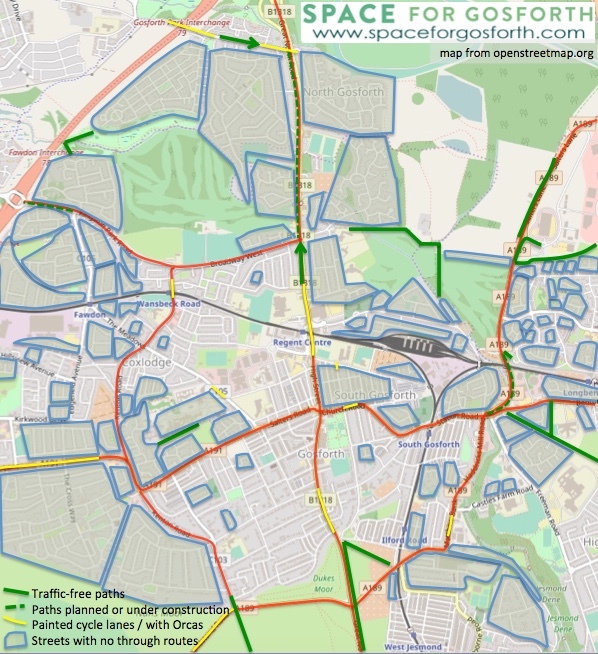 In green, mostly around the edges of Gosforth, traffic-free routes which would be acceptable for families cycling with children. In blue, streets where there are no through routes, which would be considered safe where traffic volumes are low. In much of Newcastle this is standard but it is still relatively unusual in Gosforth. Generally in these areas with no through routes no specific changes are needed to support cycling. In yellow, other painted cycle lanes and light separation using Orcas on the Great North Road between Regent Centre and Broadway roundabout, neither of which would be considered safe for children. In red, major roads with no cycling facilities of any form where anyone wishing to cycle (including children) would currently be expected to share the road with large numbers of cars, buses, vans and HGVs. Comparing this to the destinations map it shows that most destinations in Gosforth are not served by any safe cycling route acceptable for families cycling with children. Note also that we have not included signposted cycle routes, such as Moor Road North / South, where there is no separately marked space for cycling as the signposting is not sufficient by itself to make the route suitable for families with children. Clearly from this map there is plenty of room for improvement, both in terms of creating a safe connected network linking homes and destinations and for more immediate quick wins to connect together quieter areas or to improve safety and liveability for residential streets. Specific locations where small changes could help link up existing safe routes (‘missing links’). Possible route alignments for cross-city cycle routes that go through Gosforth e.g. from Kingston Park to Gosforth Business park via Broadway and Heathery Lane (a 14 minute journey by bike according to Google Maps). Issues with existing routes that make them difficult or impossible to use, including where there are issues for non-standard cycles such as those towing a child trailer and cycles used as mobility aids. Existing quiet routes that might not be obvious to others who don’t know the area. Dangerous junctions or stretches of road that are hard to avoid. Destinations e.g. schools or shops that are hard to reach by bicycle. Shared space that creates unnecessary conflict with pedestrians or other vulnerable users. Anything else that makes cycling less attractive as a way of getting round compared to other modes of traffic. Please share your ideas via the comments section below or via the SPACE for Gosforth Facebook page and we will add them to our on-line map. I’m sure everyone will be bored of me banging on about it, but Castle Farm Bridge is a nightmare for both pedestrians and cyclists. Confident adult cyclists can cross using defensive cycling to avoid cars trying to squeeze past but children or non confident cyclists would not have been on Matthew Bank in the first place. It is quite possible to come from Newcastle via Moorfield/Ilford Road Metro Bridge and down through Beatty Avenue without hitting major traffic but what it needs is for Castle Dene Bridge to be improved for pedestrians/cyclists and preferably a proper crossing at that point. This would pretty much join you up with the Coxlodge waggonway and enable you to get safely to Wallsend and beyond. The only other way of crossing the Ouseburn is at the double roundabout (just no!) or Armstrong Bridge. Armstrong Bridge is great as that portion of Jesmond Dene Road has been blocked off which has reduced the traffic significantly – *but* getting to it is the tricky part. Coming from the cycle path along the Great North Road there is really no way other than to cycle along the pavement until you reach the turning. Turning right down there from Matthew Bank on the bend in a road is not something I would do as an adult, never mind allow my children to do. Also Ilford Road is horrible. Ironically the changes to parking and the traffic calming that was installed years ago have made matters so very much worse than it ever was before (I have lived here for over 20 years). Cars don’t observe the junctions that are marked on the road that are there to let you pass and so it can be very nerve wracking to try and cycle that way. With cars parked on one side of the road and large overhanging bushes on the other side it can be a squeeze to let cars past you in places but they often try! I go that way on my bike but my kids prefer to walk as meeting a car bearing down on you and trying to swerve round them is just not fun. Excellent document, SPACE. Hopefully the planners/councillors etc will take note! Excellent article – well done to the researchers and authors! My biggest gripe about cycling in Gosforth and surrounding areas is the lack of accurate, reliable signposting. For example, the City Council spent vast sums of money on improving the cycle route from Gosforth Park to the City Centre but how would the unwary cyclist heading south at Regent Centre know to turn left at Christon Road, then right along Alwinton Terrace, across the traffic lights into Moor Road and then left across the new little Moor path to go into the town? Reaching the pedestrian lights at Jesmond Dene Road two cycle signs may be seen – both giving inaccurate directions. Such a shame because we do have some good, safe routes if only they were given greater prominence – at very low extra cost.